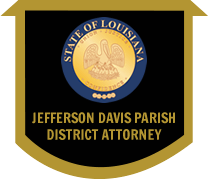 Welcome to the official website of the Jefferson Davis Parish District Attorney's Office. One of my goals is to share information about our judicial system that makes it more understandable to all. I hope this website accomplishes that purpose. Fundamentally, it is our mission to make our community a better place to live by protecting the rights and safety of everyone. I believe that we must prosecute with integrity, equality, and excellence; being ever mindful that our duty is to always seek justice. We are constantly at work for you and dedicate ourselves to the improvement of our community. We invite you to call the District Attorney's Office for assistance or to offer input and/or suggestions to help us better serve you.